A handy guide of sorts for any computer science professional, Data Structures And Algorithms Made Easy in Java: Data Structure And Algorithmic Puzzles is a solution bank for various complex problems related to data structures and algorithms. It can be used as a reference manual by those readers in the computer science industry. The book has around 21 chapters and covers Recursion and Backtracking, Linked Lists, Stacks, Queues, Trees, Priority Queue and Heaps, Disjoint Sets ADT, Graph Algorithms, Sorting, Searching, Selection Algorithms Medians], Symbol Tables, Hashing, String Algorithms, Algorithms Design Techniques, Greedy Algorithms, Divide and Conquer Algorithms, Dynamic Programming, Complexity Classes, and other Miscellaneous Concepts. 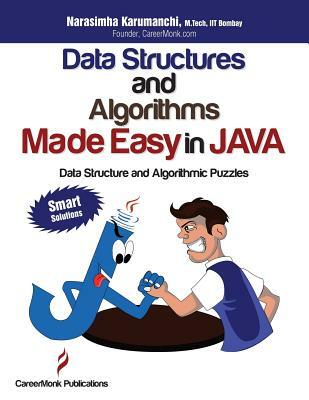 Data Structures And Algorithms Made Easy in Java: Data Structure And Algorithmic Puzzles by Narasimha Karumanchi was published in 2011, and it is coded in Java language. This book serves as guide to prepare for interviews, exams, and campus work. It is also available in C/C++. In short, this book offers solutions to various complex data structures and algorithmic problems. Our main objective isn't to propose theorems and proofs about DS and Algorithms. We took the direct route and solved problems of varying complexities. That is, each problem corresponds to multiple solutions with different complexities. In other words, we ennumerated possible solutions. With this approach, even when a new question arises, we offer a choice of different solution strategies based on your priorities. These books prepare readers for interviews, exams, and campus work. All code was written in Java. If you are using C/C++, please search for "Data Structures and Algorithms Made Easy."